The recent spate of landslide triggered by incessant rain has reportedly damaged large extent of croplands in Kasha area under Tseminyu sub-division of Kohima district in Nagaland. In a press release issued on Monday, Kasha Lowrin Youth Organization (KLYO) president, Kegwayhun Tep, stated that landslide affected vast land mass from Yapatsu valley till Shu River measuring approximately 1000 meters in breadth and 7000 meters in length. 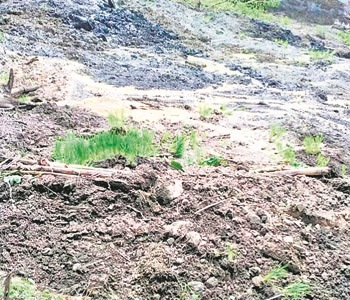 In the landslide, KLYO said extensive damage was caused to cultivated area affecting more than 40 paddy fields including jhum cultivation and fishery ponds, which it claimed were worth more than Rs one crore. Pointing out that people of Kasha area have been practicing paddy cultivation in Yapatsu valley for many decades, KLYO said the landslide has destroyed livelihood of the villagers posing a serious threat to the economy. It also expressed apprehension that damage caused to farmlands could further lead to famine. The KLYO further stated that the natural disaster besides affecting the standing crops has rendered agricultural land unsuitable for future cultivation. The organization also said the villagers have, therefore, appealed to the State Government and concerned authority to intervene and provide assistance to the affected farmers.